when this was all done?" "What's that you say? Dogs can donate blood???" They sure can, and just like their human counterparts, the blood they donate helps save lives! There are a number of canine illnesses that donated blood can help fight including cancer, anemia, surgeries after traumas, and poisoning. Currently, veterinarians in Ontario recognize there is a critical shortage of blood needed to help dogs in need of such care. If I were to hazard a guess I would say one of the main reasons for this shortage is that people simply are not aware of the fact their beloved dogs can actually donate blood, I certainly was unaware such a practice existed until just last year! 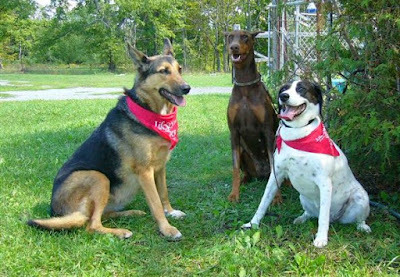 Coming up on Sunday, April 9 Barks n' Rec in Mississauga, with the help of LifeStream, will be hosting the city's first ever dog blood drive. The drive will start at noon, and you can register your pooch by emailing info@barksnrec.com or calling Matt Belvedere at 905-629-2622. Just read this story to see how you and your beloved dog can save the lives of other needy pups! "I would like to express my overwhelming gratitude to Sandra Powell and Joan Tremblay of LifeStream Animal Blood Bank, as well as Dr. Ken Ross, Kingston Vet Clinic. My dog Penelope has an incurable bleeding disorder, and her blood does not readily clot. I had been putting off having her spayed because of the risk that she could bleed to death. Last year when Sandy & Joan opened LifeStream Animal Blood Bank, Dr. Ross suggested that I contact them to see if they had any suggestions to help Penny survive a surgery. Last October Billie & Bandit, my other 2 dogs, became blood donors. Each time they gave blood Sandy would save some of the plasma. Finally 2 months ago they had enough plasma in storage to make the Cryoprecipitate, which is a concentrate of coagulation factors, derived from Fresh Frozen Plasma. Penny would need infusions of this before, during and after her surgery to help her blood to clot. Without it, she could have bled to death. Bandit also donated a unit of whole blood to have on hand in case Penny needed a transfusion. I am happy to report that Penny came through her surgery very well and is now back home with us. She did not need the whole blood transfusion. However, there was another dog in desperate need of a transfusion the same day and Bandit's blood went to help save that dog's life." Please consider having your dog be a donor, and feel free to comment if you have any experience with donating (or receiving a donation!) in the past. 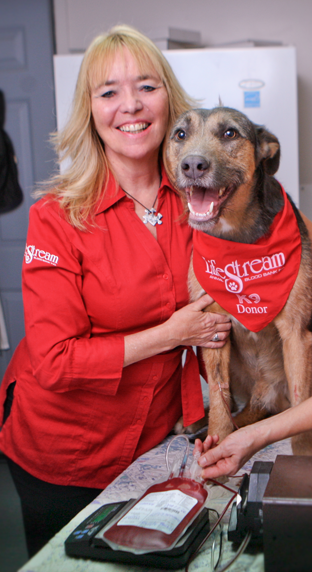 Good luck to Barks n' Rec and LifeStream at the blood drive, and thanks to you both for helping dogs in need!